One of our most popular recipes for the last year or so has been our Homemade Enchilada Sauce…the red kind. Since then, I’ve had quite a few requests for green enchilada sauce. And I don’t like to disappoint…plus, I adore green enchilada sauce and really wanted to figure out how to make it from scratch, instead of out of a can. As luck would have it, my co-op basket this week was FULL of tomatillos, peppers, onions and garlic. I’m pretty sure it was a sign. 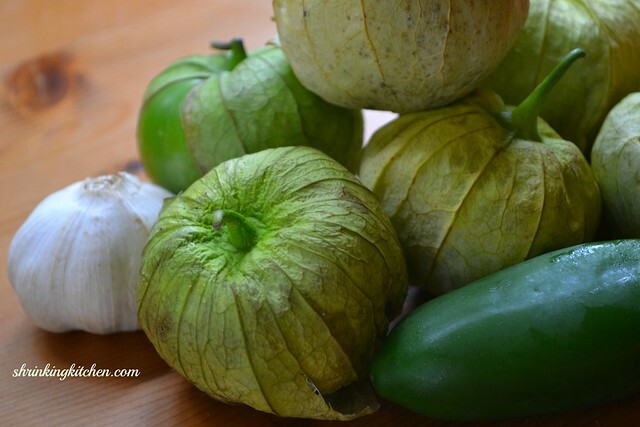 Have you ever worked with tomatillos? They arrive in a husk. And they’re pretty ugly. Peel back that papery husk and you reveal a bright green vegetable…ahem…I mean fruit. 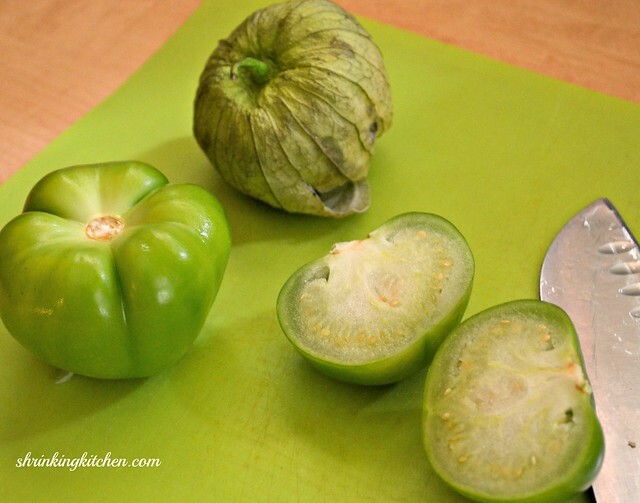 The tomatillo itself is kind of weirdly sticky. Nevermind that. Just rinse those babies off and chop them up. My enchilada sauce started in the blender, hung out on the stove, then I finished it back in the blender. It takes a while to make, but requires very little babysitting. A stir here and there until it thickens up. That’s all. Is it better than canned. Uh, hello. YEAH. I’d double the batch and freeze some for later. For those nights when you’re dying for Mexican food. For me? That pretty much sums up any day that ends in ‘Y’. Serve this up in your regular enchilada recipe or mixed in with some smashed avocado for a delicious dip. Heat 1 tablespoon of olive oil in a heavy bottomed saucepan over medium high heat. Add the onion and garlic and saute until soft, about 5 minutes. 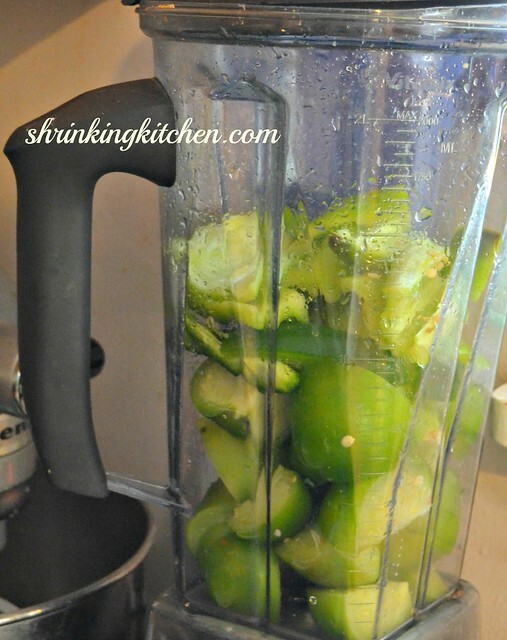 While the onions and garlic are working, throw the tomatillos, cilantro, jalapeno, poblano and lime juice into the blender. Blend on high speed until smooth, adding the remaining 1 tablespoon olive oil to get things moving. Pour the tomatillo mixture in with the onions and garlic. Add the vegetable broth, cumin, chili powder, salt and pepper and whisk to combine. Bring to a boil then reduce to a simmer. Allow to simmer on low heat for about an hour to thicken the sauce. If desired, blend with an immersion blender or throw the mixture back into the regular blender for a smoother sauce. Serve in your regular enchilada recipe or even as a dip for tortilla chips! can you jar and water bath this recipe? Essentially what it says is add a Tablespoon of lemon juice to the bottom of the jar for every pint of canned tomatillo – two Tablespoons for every quart. Interesting. Wouldn’t you think the lime juice in the recipe would have the same effect? Since it’s citrus? Thanks Ben for bringing up the canning aspect of this sauce. I wanted to add that it is very important to acidify something like this if you are going to water bath can it. Of the ingredients in this recipe just about every ingredient is low acid so therefore not a good candidate for WBC. Unless you omit the low acid ingredients or add a fair amount of acid then the food is vulnerable to spoilage and botulism. I hope that pressure canning takes off eventually because of all the versatility and diversity of recipes I can pressure can as opposed to WBC.WBC is pretty limited in what you may can that way. I will pressure can this recipe using the amount of time for the ingredient that requires the longest canning time. PS it’s also possible to use granulated citric acid to acidify the sauce. Mainly what I’d advise is to taste the sauce with extra citrus or acid in it and see if you like the taste of it before WBC it. Freezing may be another great way to preserve it. Is this a pretty mild sauce? It is pretty mild. You can add more or less jalapeno to your liking, or use a milder pepper,like poblano, if you are very sensitive to heat. Great recipe. Way to go keeping sodium 1/5 that of canned. Only thing I did different was I used white onion instead of yellow. A bit more flavor than yellow especially for Mexican dishes. Interesting that this green enchilada sauce is… not green? If you’re sauce is not a satisfactory green, check out the ingredient list on your veg broth. Tomatoes are likely the culprit. Great recipe. Approved by my super picky, canning pro 6 year old son.